What Are Glulam Timbers and How They Are Used? The term glulam is an abbreviated term that stands for glue-laminated timber. A glulam is made with multiple layers of solid wood lumber bonded together with high-strength adhesive to form a single structural unit. Builders often refer collectively to all types of laminated beams or other laminated structural wood materials as glulams. Glulams are versatile and innovative construction materials used widely in commercial as well as residential projects. A glue-laminated timber is an engineered wood product, meaning it is made from wood but is machined and assembled to precise specifications to create a predictable, dimensionally stable building material. Other common engineered wood products include plywood, oriented strandboard (OSB), and laminated veneer lumber (LVL). A glulam beam looks like a stack of 2 x 4s (or larger lumber) glued together on their broadsides. This is in contrast to other engineered members, such as LVL (laminated veneer lumber) and Microlam beams, which look like very thick plywood, with very thin layers of wood glued together to form a thicker mass. Glulam members are sold in several standard widths and lengths and can be custom-fabricated to meet almost any design specifications. They are commonly used for large curved or arching members to build vaulted roofs, domes, and even bridges. Glulam construction offers superior strength and stiffness over dimensional lumber, and pound-for-pound it is stronger than steel. 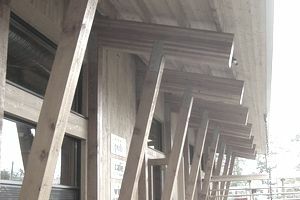 Connections for glulam beams are typically made with bolts or steel dowels and steel plates. Glulam members are classified by specific strength properties and are given a rating from a stress classification system. The first part of the rating is the reference bending design value, or its flexural loading. For example, a classification of 24F signifies that the member has 2,400 pounds per square inch (psi) of flexural loading. The second part of the rating is the corresponding modulus of elasticity value of the glulam member. For example, a label of 24F-1.8E indicates a reference bending design value of 2,400 psi and a modulus of elasticity of 1.8 x 10^6 psi. Framing. Framing appearance grade is the common choice for home-building and other areas where glulam is specified and will be combined with dimension lumber. This grade is recommended only for use in concealed areas. Industrial. Industrial-grade appearance for glulam material is recommended for areas where the aesthetics are not a major concern. Under this appearance grade, the glulam is finished slightly better than with the framing grade, but it is not an aesthetic product. It should be used in areas not visible to the general public. This appearance grade shows some wood imperfection on its surfaces, such as knots and voids. Architectural. When glulam is going to be used as a facade material or exposed element, architectural-grade appearance is highly recommended. This grade offers a high-quality finished product, where wooden voids and imperfections are filled or treated to provide a smoother, more attractive surface. Premium. This grade of glulam is available only through special order and usually is reserved for special situations or predetermined areas, where a high concentration of people is expected. Premium-grade glulam offers the smoothest surfaces for the highest-quality finished product. Glulam members should be handled carefully to prevent any damage or reduction in their structural capacity. To prevent surface scratches, us fabric slings when lifting. Members should be stored vertically, if possible, and always should be protected from the weather by a covering of plastic sheeting. Unless glulam material is intended for exposed areas, it should be protected from outdoor exposure until it is ready to be installed.